Every time I think about my vacation to Santorini and Athens this past May, I keep telling myself I need to go back! I'm so grateful to have had the opportunity to go and visit one of my dream destinations. Pictures do not do it any justice but I thought I'd still put together a short post of some my best photos from this trip. As you already guessed, I have more than a thousand pictures and choosing which ones to post was so hard. I hope you guys love them as much as I do. Check out my best photos below. This was our view from a restaurant that we came across on our way back to our hotel from Red Beach in Akrotiri. This is Katharos Pool Villa Complex. We stayed here during our time in Santorini. The villa does not overlook the caldera but it's still nice. The pools illuminate blue lights at night, which is pretty cool as you can see them from afar. I never thought a picture that has not been photoshopped or retouched could ever look this cool! I need to make an enlargement of this. I have seen many sunsets but none compare to the one in Santorini. I understand what the hype is all about when it comes to Santorini and sunsets - there's nothing like it. This started off as such a cloudy day but thank God the sun came out later that day and we got some of the best sunset pics from this day. This was taken in Oia, one of the most popular villages in Santorini. It stands all the way at the top of the mountain and everyone claims they have the best sunset views. 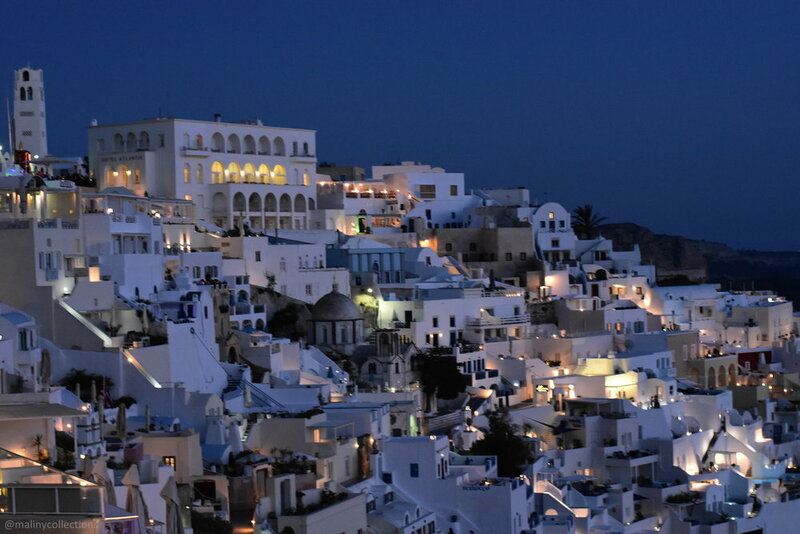 A lot of reviews recommended booking a hotel in Oia, which is where we stayed but you'll be just as fine staying in Fira, which is the main town or capital city of Santorini. Fira and Oia look exactly the same. There were so many couples getting married in Santorini. Who wouldn't want to get married there? I was lucky enough to capture this moment. This is Kamari Beach. I've never seen a beach with black sand and red sand all on one trip. This is Thirassia Island. This is the island I said was full of stray cats. I was forced to climb on Kevin's back because there was no way that I was going to pass in the middle of cats!!! My phobia is out of control. I was kind of sad that we missed the sunsets in Oia on two occasions - I fell asleep on the first one and on the second one, it was my birthday and our dinner run late but we managed to catch a glimpse of the sun setting. This was taken at the Port of Athinios at the end of our tour to The Volcano, Hot Springs and Thirassia Island. This was taken from our hotel balcony in Athens. We had the best view of the Temple of Olympian Zeus from our room. You can read all my travel diaries from this trip and many more by clicking on the Travel Diaries tab. Thank you all for stopping by and have a blessed day!